^ "computer keyboard". TheFreeDictionary.com. Retrieved 2018-06-26. The Apple Adjustable Keyboard is an ergonomic keyboard introduced by Apple Computer, Inc. in 1993 for the Macintosh family of personal computers. The keyboard attaches to the computer via the Apple Desktop Bus port. The last Apple computer released compatible with this keyboard without using a USB to ADB adapter was the Power Macintosh G3 (Blue and White), as it was the last one with the Apple Desktop Bus. It aimed to solve repetitive stress injuries resulting in carpal tunnel syndrome, after several computer keyboard manufacturers were sued for poor design. The Apple Adjustable Keyboard came with contoured plastic wrist rests, and a separate keypad with function keys and arrow keys. This was the third and last time Apple offered a separate numeric keypad. Unlike its predecessors, it was not sold separately. The keyboard also included volume buttons and a record button on the right side of the keyboard. It was hinged at the top, allowing the user to adjust the angle between the right and left sides of the keyboard. The split came between the key pairs: 5/6, T/Y, G/H, and B/N. The space bar floated midway between the two parts. Although the keyboard addressed several ergonomic problems, it was reviewed poorly due to using a large amount of desk space, mainly because of the optional palm rests. The keyboard uses Alps SKFS switches, which provide tactile feedback with a slightly "clicky" feel. The Apple Extended Keyboard (AEK, model M0115) is a keyboard that was first sold separately alongside the Macintosh II and SE starting in 1987. It was replaced in 1990 by the Apple Extended Keyboard II (AEKII, model M3501) which was pre-packaged with Apple Professional Desktops starting with the Macintosh IIsi. Both versions were very similar, differing primarily with the addition of adjustable height legs in the AEKII and other minor changes. Both used Apple Desktop Bus (ADB) to connect to the host computer, with ports on either side to allow daisy chaining of another input device, typically a computer mouse or trackball. The keyboards are widely considered by enthusiasts to represent the golden era of Macintosh keyboards. Numerous reviews by users consider it to be the best keyboard ever, even better than the famous IBM Model M keyboard. Retrospective articles credit the success of the product to a combination of sound, feel, and durability.The move to USB connections starting with the original iMac led to the introduction of new keyboard designs using rubber dome switches rather than Alps Electric switches. This, in turn, has led to a market for 3rd party keyboards that replicate some of the AEK feel, with Matias' line of Tactile Pro and Quiet Pro keyboards perhaps being the most notable. The Apple Wireless Keyboard is a wireless keyboard built for Macintosh computers and compatible with iOS devices. It interacts over Bluetooth wireless technology and unlike its wired version, it has no USB connectors or ports. Both generations have low-power features when not in use. It was discontinued on October 13, 2015, and was succeeded by the new Magic Keyboard. A BAT keyboard is a one-handed chording keyboard consisting of a base, on which the hand rests, and seven keys. Through pressing combinations of keys, one can attain the same functions as a regular keyboard. The keyboard can be useful for those with a disability and also as a complement to the mouse, on which the other hand can remain. The BAT keyboard exists in left-handed and right-handed versions, which can also be used simultaneously with each other or even with another alphanumeric keyboard if desired. There are two major English language computer keyboard layouts, the United States layout and the United Kingdom layout defined in BS 4822 (48-key version). Both are QWERTY layouts. Users in the United States do not frequently need to make use of the £ (pound) and € (euro) currency symbols, which are common needs in the United Kingdom and Ireland, although the $ (dollar sign) symbol is also provided as standard on UK and Irish keyboards. In New Zealand, the US keyboard layout is the de facto standard. In commonwealth countries like Australia, Canada, Pakistan, and India, the US keyboard might also be used. Conkeror is a discontinued Mozilla-based web browser designed to be navigated primarily by a computer keyboard. Its design is mainly patterned after the text editor GNU Emacs, with some influence from other programs, including vi.It was originally written by Shawn Betts, the primary author of keyboard-driven ratpoison and Stumpwm tiling window managers. Formerly an extension for the Mozilla Firefox browser, it is now developed for XULRunner as a stand-alone application. Development of the extension version was abandoned in 2007. Conkeror is released under the same set of free software licenses as Mozilla: the GNU General Public License, the GNU Lesser General Public License, and the Mozilla Public License. CyKey (pronounced "sai-ki" or "psyche") is a one-handed chorded keyboard, catering to both left- and right-handed users. It features nine keys, grouped into three sets of three. CyKey was introduced in 1996 by Bellaire Electronics. It was a follow-on to the Microwriter, meant to be used with personal computers and Palm PDAs. It was named after Cy Endfield, co-inventor of the Microwriter. FrogPad is a small chorded keyboard about the size of a numeric keypad that can be used with one hand. It was produced by Frogpad Inc. The keyboard is optimized by character frequency. 85% of average keystrokes in English text can be typed without chording, and chords are limited to 2 fingers (opposable thumb and one finger). As a result, the FrogPad has many more keys than a GKOS or Microwriter or Baudot keyboard but fewer than a conventional computer keyboard. A keypad is a set of buttons arranged in a block or "pad" which bear digits, symbols or alphabetical letters. Pads mostly containing numbers are called a numeric keypad. Numeric keypads are found on alphanumeric keyboards and on other devices which require mainly numeric input such as calculators, push-button telephones, vending machines, ATMs, Point of Sale devices, combination locks, and digital door locks. Many devices follow the E.161 standard for their arrangement. The Magic Keyboard is the current computer keyboard produced by Apple Inc. It was released alongside the Magic Mouse 2 and the Magic Trackpad 2. It is the successor to the Apple Wireless Keyboard. A photovoltaic keyboard is a wireless computer keyboard that charges its batteries from a light source such as the sun or interior lighting, addressing a major drawback of wireless computer peripherals that otherwise require regular replacement of discharged batteries. The QWERTZ or QWERTZU keyboard is a typewriter and keyboard layout widely used in Central Europe. The name comes from the first six letters at the top left of the keyboard: (Q W E R T Z). Silicone rubber keypads (also known as Elastomeric Keypads) are used extensively in both consumer and industrial electronic products as a low cost and reliable switching solution. The space-cadet keyboard is a keyboard used on MIT Lisp machines and designed by John L. Kulp, which inspired several still-current jargon terms in the field of computer science and influenced the design of Emacs. It was inspired by the Knight keyboard, which was developed for the Knight TV system, used with MIT's Incompatible Timesharing System. The Symbolics-labeled version shown here was only used with the LM-2, which was Symbolics's repackaged version of the MIT CADR. Later Symbolics systems used a greatly simplified keyboard, the Symbolics keyboard, that retained only the basic layout and the more commonly used function and modifier keys from the space-cadet keyboard. A thumb keyboard, or a thumb board, is a type of keyboard commonly found on PDAs, mobile phones, and PDA phones which has a familiar layout to an ordinary keyboard, such as QWERTY. The inputting surface is usually relatively small, and is intended for typing using the available thumbs, while holding the device. 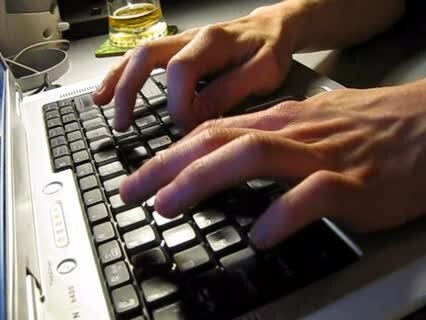 Typing is the process of writing or inputting text by pressing keys on a typewriter, computer keyboard, cell phone, or calculator. It can be distinguished from other means of text input, such as handwriting and speech recognition. Text can be in the form of letters, numbers and other symbols. The world's first typist was Lillian Sholes from Wisconsin, the daughter of Christopher Sholes, who invented the first practical typewriter.User interface features such as spell checker and autocomplete serve to facilitate and speed up typing and to prevent or correct errors the typist may make. A virtual keyboard is a software component that allows the input of characters without the need for physical keys. The interaction with the virtual keyboard happens mostly via a touchscreen interface, but can also take place in a different form in virtual or augmented reality.